My first book is scheduled to come out the last week in September. It’s an interesting time for me. As I look back over the last nearly 20 years of writing (I’ve worked full-time as a writer since 1997), I realize I’ve had a lot of illusions about what this time would be like. I think as young writers we tend to imagine that our writing lives will peak with publication. Turns out it’s not really like that. Already I have so much to do in the coming months to market the book. Soon I’ll be starting edits on the second novel I have under contract. And there’s my work in progress, which is still, well, in progress. Publication now feels less like a peak and more like a change in course, after which the journey continues…uphill. No matter how you look at it, though, publication—especially the first one—is a milestone, which invites reflection. What have I learned along the way? I should have been more careful with critiques. As writers, we’re all told we need to get feedback on our work. I still believe that’s true, but I now know it’s extremely important to be careful with critiques. In my early years, I tended to believe most everything a teacher/editor/other writer would tell me. After all, they all had more experience than I did. Plus, like most creative people, I heard the negative comments a lot more clearly than the positive. Which wasn’t good for my confidence as a young writer, or my progress toward becoming a published novelist. After years of receiving critiques at conferences and contests, as well as hiring professional editors, I now know how subjective these things are. Some contests deliver three separate critiques, for example, and I’m still amazed at how different they can be. One reviewer will heap praise on a piece of writing while another will give it only mediocre marks. One will say the dialogue is natural and well done, while another will say the dialogue, especially, needs work. Today, when reading critiques, I take most of the comments with a grain of salt. It’s only those that ring true for me on an intuitive level—the ones that I respond to in my gut—that I pay attention to. The rest I do my best to forget. I should have discovered my weaknesses earlier. It wasn’t until several years into my fiction writing practice that I found a really good editor who pointed out that I needed to work on plot. She had struggled with it, too, and told me how she had practiced to improve her skills. That feedback was invaluable to me. I dove into plotting as if I was back in college. I bought books, took classes, made outlines, and studied story structure. Soon, I was getting consistent positive feedback about my plots. Did that ever feel great! Looking back, I realize I could have advanced more quickly if I had discovered my weaknesses earlier. How? By researching and finding writing mentors who knew what they were doing, and were genuinely interested in helping young writers succeed—and then being willing to invest in their guidance. I should have started with small publishers. We all dream of publishing with the big guns when we start out. We want names like Penguin, Random House, Tor, and the like on the title pages of our books. We submit to those giants. And we wait. And we wait. Most large publishers take up to six months to get back to you, if they ever do get back to you. (Many these days make no response at all if they’re not interested in the story.) That’s a lot of time wasted. There are some new writers who break through to these publishers on their first try, but the odds are against us. Meanwhile, a number of reputable small publishers are very eager to find new writers, and committed to representing work they believe in. If I had started with these publishers, I might have gotten a contract much earlier, and been further along in my fiction-writing career today. I should have submitted a lot more. As a young writer, I would send my story out to a couple publishers, and then wait for their responses. When I received rejections, I would feel disappointed, and question my abilities as a writer. I doubted I would ever get “good enough” to be published. All these negative feelings would prevent me from submitting again for a considerable amount of time. This happened a lot with my (now) first-published book. Years passed and I wrote other novels I didn’t try to publish. For some reason, the characters in this one stayed in my head, the story still alive in my thoughts. One day, I got a little angry. Heck with it, I thought. I’ll just send the darn thing back out there. This time, I sent it to several small publishers. That resulted in a publishing contract. After I signed the contract, I was still receiving requests for the full manuscript from other publishers. Was it just coincidence? Timing? Could have been, but I’m more likely to believe that if I had been more aggressive in my submissions earlier on, the book would have found a home years before it did. I should have paid more attention to positive comments. That note made me happy, but I too quickly allowed rejections to overpower the encouragement. Looking back, I should have framed that letter, along with all the other encouraging notes that came in over the years, or at least put them somewhere I could see them now and then. We writers are way too sensitive to negative feedback. We need to take any positive feedback just as seriously, if not more so. I should have thought long-term. We think our writing careers start with publication, but that’s not true, especially in today’s world. Now, authors are required to do the majority of the marketing for their own books. That means creating a platform as early as possible, and growing it over time. This is something I didn’t understand until late in the game—partly because the radical changes in publishing happened quickly, and partly because this whole idea of building a platform was practically nonexistent when I first started out. Looking back, I realize I would have been better off if I had taken a long-term view of my fiction-writing career. I was too limited, thinking it was all about getting better and getting a publishing contract. Both of those things are still key to succeeding, but now it’s also important to have a solid presence online, and to be continually working to attract an audience, book or not. I’ve never had a problem running my freelance business as a business, but fiction felt different to me. It was more my joy, and my dream. Now that I have my first book coming out, I realize that a lot of the things I’ve been doing in my freelance business I could have been doing for my fiction writing, too. This is the hardest one. When you’re all alone, working away day after day, year after year, it’s very difficult to believe that one day, you’ll be signing a book contract, and one day soon after that, you’ll be preparing for the launch of your first book. We pay for not believing in ourselves. It holds us back. It stops us from fully investing in our dreams. I was never sure if my novels would be published, ever, so fiction writing remained something I did in my off hours. Don’t get me wrong. I worked my tail off. Having a full-time job was something I had to do, and squeezing writing in after that was never easy. I dedicated myself to practicing, studying, and learning, but I felt almost guilty about it, like it was a self-indulgent thing to do, to spend all that time on something that might never culminate in an actual published book, or (gulp) a fiction writing career. If I had believed in myself wholeheartedly, I might have done a better job of paving the way for myself. I might have gotten more done on my platform, for example, or felt more confident about devoting the time and resources needed to support my writing dreams. Hindsight is twenty-twenty, as they say. I made mistakes along the way. I hope others might learn from them, but I also hope that we can all feel more entitled to make mistakes. We often fear getting it wrong, but there’s no way to learn in this field without messing up every once in a while. Make mistakes. Go for it. Believe in yourself. If you keep at it, one day, you will succeed. Did you make mistakes before receiving a publishing contract? Or do you worry you might? Please share your thoughts with our readers. Colleen M. Story writes young adult fantasy and adult literary novels. She’s also a full-time freelance writer and editor specializing in the health and wellness field. 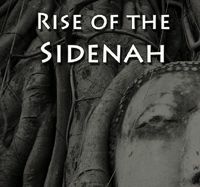 Her first book, Rise of the Sidenah, is scheduled for a September 24, 2015 release. Find more on her website, ColleenMStory.com, and at WritingandWellness.com, or follow her on Twitter: @colleen_m_story. Rise of the Sidenah is a magical fantasy about a young sculptress forbidden from practicing her art, until a powerful man offers her an opportunity she can’t refuse. He draws her into a world of deceit, murder, and betrayal, leaving her no choice but to engage him in battle to save the ones she loves. You're right on every single point, Colleen - but we can only know what we know when we know it, right? One of the craziest parts of this writing thing for me was that you had to discover something you already knew, deep inside your brain - how YOU write a story. That took me longer to learn than the craft! Sigh. Have you guys checked out Colleen's Writing and Wellness? It's a must to keep you healthy as a writer! Thanks for blogging with us, Colleen, and BEST on your debut! I love blogs which make me stop and think about what this thing called writing is all about. Your advice helps to slow down the roller coaster, Coleen. Very helpful, and thanks for sharing. Thanks for this heartfelt piece. Great advice, every point. And glad to hear you got where you wanted to be in the end. #5 in particular resonates for me today. Thanks for the inspiration to remember the positives, and to push on. And congratulations on your release! Always great to see another fantasy author succeed. Best wishes to you! That one spoke to me as well, Vaughn. It's so easy to get sucked into everything else and forget the positives that are happening at the same time. Thank you for an excellent post and very important information! I'm terrible at taking bad critique sometimes. We don't want to believe our 'baby' could have blemishes, so we often turn a blind eye. I learned long ago that negative critiques are different than constructive ones and those are the ones that bear a second look. Whether I use the suggestions or not, I ask myself (and often the one who gave the advice) why she/he said it. Sometimes I get a glimmer of dawning, other times I don't, and sometimes I can see it's the other person's voice trying to crowd my own out and I have to just ignore those, but I always try to take something away from every critique. Thanks for sharing your journey, Colleen. Congrats on the contracts!!! Congratulations on your book deal. I love #3. That would be fine with me for a first book. I'm querying agents right now. Did you query agents before submitting directly to publishers? I'm looking forward to landing one to work with me on final edits before querying publishers, putting it up for auction or whatever the process might be. Loved reading this. I'm still working on my first novel and reading insights like these from writers who've been there and done that is not only encouraging, but very helpful. Sharing this with all my neophyte writing buddies! This was really helpful--especially at this point in my writing journey. Thank you very much for your insightful comments. Elisabeth—I was all over the place in the beginning. I read a billion books and websites and hired some editors. One was super helpful (Lois Gilbert, just Google with "editor") and many others somewhat helpful and somewhat not. I created a folder that I still have that's full of magazine articles and printed-out website pages about plotting. Screenwriting books and sites are hugely helpful, as are materials on Greek myth. I also submitted to contests to get the feedback. That's when I knew I was getting better--when the "plot" section of the critique had high marks. (PNWA, Arizona Authors, Southwest Writers all good critique contests.) The tool I have today that I LOVE is "Blueprint Your Bestseller" by Stuart Horwitz. Once you have a rough draft of a novel, he has a way of helping you carve up (literally) your manuscript that really clarifies what the story is about and what you need to do to fix it up. "Story Structure Architect" by Victoria Lynn Schmidt was also good. Hope that helps! First of all, Colleen, congratulations on your fiction book deal. I'm looking forward to reading your novel! I have subscribed to Writers in the Storm and received emails for about a year. When I first subscribed, I was in the throes of creative ecstasy writing the first draft of my manuscript for my first novel. I've written poetry, short story, creative non-fiction and tinkered with novel ideas for nearly forty years, writing snippets of novels along the way. I think I may have a couple of them lying around here, but for the most part I left them somewhere in the dust while I tried to simply survive and raise my four children. I began a blog in 2010, only submitting on a regular basis in the last two years and gaining a nominal readership. In 2013, with my aunt's encouragement, I submitted a creative non-fiction piece to an online magazine and they published it. I made no money, but that byline got me a lot of mileage. A flurry of creativity ensued and I wrote songs, stories, novels and poems with utter abandon. In the last year my enthusiasm waned to a slow trickle. I finished my manuscript in January of this year, and I have it safely stored in several places on my computer and on back-up drives. It is also printed and bound, sitting right here beside me as I type these words. Life can knock you off course, into a ravine where you bounce into a raging river that takes you so far from where you were it's a wonder you find your feet. Loss, financial stress, family drama, health concerns--all of which we all must deal with at some point in our lives--seem to conspire to take the joy and passion away for good. So, after several months of some rough rapids, I found the shore and now I'm standing here, still dripping wet, wondering how to get back where I started. Call it fate or divine intervention, but today I decided to open the email notification from Writers in the Storm, featuring your blog piece, thinking I might read a few lines and see if there is anything I could glean from your wisdom. Thank you for sharing your insight. The wave of relief that someone out there "gets" how I feel and what I'm going through has helped me to take this pressure of life and moreover, the pressure I put on myself, and set it aside. I now have a renewed but clearer understanding of myself and what I need to do next. Kim, your comment made me sad for you at first, and then so happy to hear that this post was helpful! This writing life is a roller coaster there's no doubt, and I'm so grateful for forums like these where we can all share what it's like and realize we're not alone--that it's all just part of the gig. Those encouragements you got along the way are important, and they mean something—they are signs that you were on the right track. We forget that with time and the questioning starts all over again. I received some great wisdom from mentors along the way—one that I often return to (from Dean Wesley Smith, whom I mentioned in another comment) is to finish the story and start the next thing, and the next, and the next. It's through finishing projects and piling them up that we get better at this, and in the midst of that devotion to the craft, as long as we're submitting and continuing to believe in ourselves, the magic starts to happen, and eventually, the writing will be recognized. Best of luck and thank you!! Hi, Susie. The agent question is a good one. I would direct you to Dean Wesley Smith's blog. I took a workshop from him and his wife, Kristine Kathryn Rusch. (Highly recommended.) It was after that workshop that I started going directly to small publishers and that my career got going. Before that I was submitting to the big guys and to agents and spinning my wheels. Now I'm very glad that I didn't go the agent route. It takes much longer—you wait to get an agent, then you wait for agent to get a publisher, IF she can, and if not, you're back to square one again. Can't tell you how many stories I've heard just like that from other writers still waiting to get a contract. As a young, unproven writer, there isn't a lot to negotiate in the contract anyway, and that's mainly what your agent does for you. (Yes, they're supposed to have an "in" with the big publishers, but with only a few big guys left that possibility is slim.) You then pay that person 15% forever. I got an IP (intellectual property) lawyer to review the contract, paid him a one-time fee, and now whatever I make on royalties is mine. I can definitely see how an agent could be helpful once you're established as an author, or if you already have a huge platform and are in a position to make a big deal, but when you're trying to tear down the wall to me it makes a lot more sense to get going with publishers who will give you a chance. Hire an editor, clean up your manuscript first, then go for it. Best of luck! Thanks so much! I will check out his blog. As I read this, I felt most of your words could have been my own! #4 really hit home. I love writing, but I'm not aggressive about trying for publication. Thanks for sharing your experience and insight. Thanks, Carol! Hope you submit more. You may be surprised! Great blog. I have been published before but not in years now. A long illness of both my husband and my mother took away my writing time and my ability to focus on it as well. I am just now getting back into it. And I am sure my foremost flaw is not believing in myself enough. But not being aggressive enough is right there alongside that flaw. Thank you for the encourage and I am so very happy for you with your success. Write on. Sorry to hear of the health issues—they have a way of stopping everything (why I write about taking care of ourselves on Writing and Wellness). So glad you're getting back into the writing now. I think most of us aren't naturally aggressive as writers so something to learn, and when I say "aggressive" I really mean just getting out there and believing in yourself. Best of luck and thank you! Thanks for sharing your hard-earned wisdom, Colleen. All of your points are great reminders--together they pack a punch. Great success with your debut! Thanks for sharing! Very sound advice and well said! I can't share this post enough! I loved your post. What really hit home was that you felt self-indulgent for writing. Because writing is time consuming..with nothing to show for it, to anyone, it seems to others that I am dilly-dallying. Basically, I might as well be sitting by the pool, getting a tan...because that is how they see it. I have finished two novels, in the works with my third and yet, I am not published yet. So, to those around me, I have nothing to show for all that work. I feel proud and accomplished! I know I have done an amazing thing and am excited to push forward. I AM believing in myself! You are mere proof that I will do it! congratulations on your publication! Thanks for the reminders. Great insights ... everyone who's starting out (or, quite frankly, just EVERYONE) should read this blog! Congrats on the contract! Hi Colleen - #7 is the one that hit home for me. I think with other jobs, family, or just life getting in the way, I've put my own dreams on the side-burner. Or worse, not on the stove at all! I'm about halfway through my first manuscript, and it's the most terrifying, wonderful, solitary, thrilling thing I've pushed myself to accomplish in a very long time. Thank you for sharing your experience and wisdom. So easy to let other things get in the way, for sure. But I've found our dreams are there for a reason--they push us to become more than we thought we could. So glad you're continuing on! I hear great things about small publishers. Not all of them, but many of them. This is great advice! Although I've had to learn to avoid that "S" word (should) - it tortures me. Thanks, Jenny! Yes, I hear you on the "shoulds." Perhaps "I would have progressed faster if I had..." would have been better wording! (ha) I try to apply the shoulds more to learn from the past than to restrict the present or future. This was a wonderful, encouraging, and helpful post. I am in the throes of revising (again!) and excited about making my piece the best it can be. With your advice, I now have a few new directions to take it in. Sounds like you're getting close, Kim! Best of luck! What an excellent post - I found myself nodding in affirmation as I read each of your points. I like using a critique group when I get to an (almost) final draft of my book(s), but with three different critique readers, they often disagreed on what was good, and what needed work. I had to learn to listen to my 'gut' and take in what felt right, ignore what didn't. I agree with your suggestion to find the weakness in your writing, and work on it through mentors, classes, research. Lastly, what an eye-opener about the small publisher. I had an agent and several great rejections from big publishers, but decided to self-publish. My agent never went to smaller publishers, which I think now was a mistake. Nice to meet you! Thanks, Pamela! Yes, I've heard similar stories of agents kind of giving up in the few big guys don't bite. Glad you kept going and moved forward anyway. Nice to meet you as well! I know marketing is important. I just saw a TV commercial with James Patterson plugging his new book. If he feels it's necessary to do that, how can any other author say there's no need to market their books? This is HUGE!!! Thank you so much for what you said about BELIEVING the good comments even more than the negative ones. My writing students never believe that. Some of them think I'm not "for real" as a teacher because I spend much more time telling them what they do right. When they ask, I always say that there are plenty of people out in the world who can and will tell them what's WRONG with their work. Me, I'm going to tell them what works. And, yes, I do point out when something doesn't work, but I don't do that "...this so so good, BUT..." thing that I remember so well from college. THANK YOU and BLESS YOU for your post! I'd love to reblog this. I'll post the link on my blog, justcanthelpwriting.wordpress.com. This could so be me! I'm just now trying to decide whether to self-publish my way-outside-the-conventional-genres novel or to go on submitting to agents. I haven't gone the small press route because I found myself thinking that if I have to do all the marketing, why share the net? But you make me realize that I'm probably thinking too short-term. Having a new published novel (I published five with big presses before going back to school) would be a gateway to new contacts and new opportunities. Your thoughts on feedback also resonated. Having gone the beta-reader route as well as working with my writing group, I've decided not to tear up my work unless it's for someone who has made a commitment to the book, for the very reasons you state: six reviews, six different ideas as to what just has to be done. In my excellent writing group, I listen for consensus and a good argument that the advice is well-grounded. I often receive the kind of feedback that strikes me instinctively as valuable, sometimes pinpointing a problem I knew at heart needed attention but which I hadn't quite identified. Thanks for some calls to action. I love him, too. His name is Paddington. Another point of yours that resonated with me: how easily I begin to question my work when agents looking for a blockbuster don't respond. I suspect that it's the kind of book that would grow a readership slowly through word of mouth. I chose to write that kind of book. I should not be so easily dissuaded from its value. Thanks again!